Sometimes it feels like the world is becoming awfully small. You can fly direct to Tokyo from Toronto, WiFi on the plane and, once on the ground, head to a local store to purchase a prepaid SIM. And while it’s not particularly difficult to unlock a carrier-locked smartphone, the quick rise of the Nexus line has brought to light the value of factory unlocked phones. 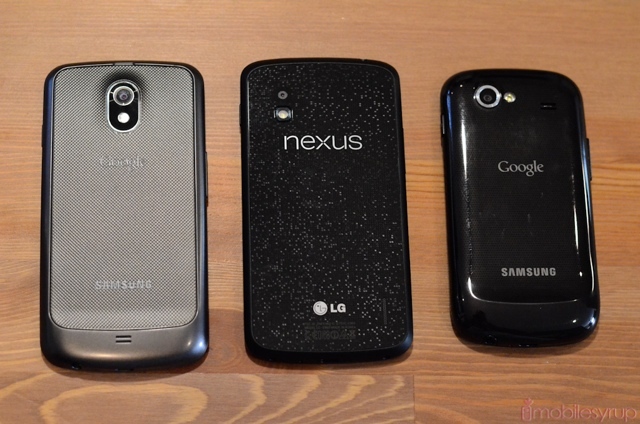 But more importantly, the Nexus line has always been about the best of Google. Partnering with various OEMs — HTC, Samsung, Asus and now LG — there is value in seeing where Android is headed next. 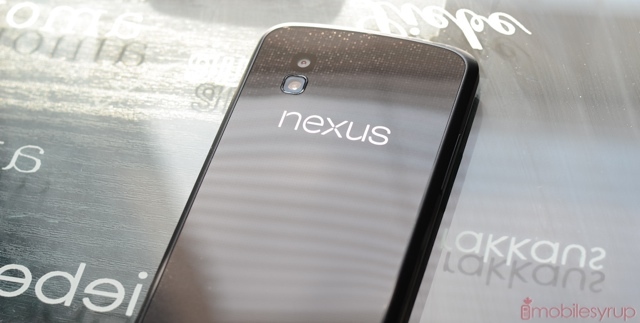 The Nexus brand is a bellwether for the future of the operating system. Now in its fourth year, the Nexus 4 is simultaneously the cheapest and most mature offering from Google yet. LG may have received its fair share of derision from users disappointed with its slow pace of software updates, but there is no doubt that the company can make an attractive and premium smartphone. With the Nexus 4, Google and LG have managed to forge an entirely new segment of the market: affordable, premium handsets with no carrier intervention. While there are numerous reasons why one would want to stay within the carrier-contract fold, the Nexus 4 provides the first tangible look at a contract-free future, and it’s bright. The Nexus 4 is a combination, spiritually, of the Galaxy Nexus and the LG Optimus G. Its roots lie in LG’s recently-released phone (which we liked a lot), and the Nexus 4 is covered in Gorilla Glass on both sides, plus a similar port/button layout to its carrier-sold sibling. While the Optimus G feels a bit more like a true high-end phone, the Nexus 4 carries a fair amount of design prowess in its own right. 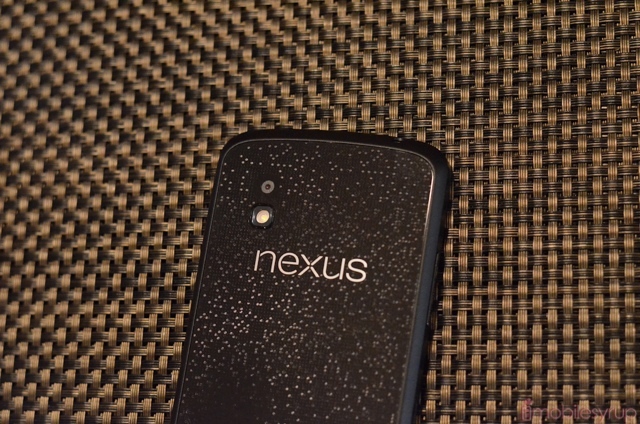 Whereas the Optimus G has slippery sides of glossy plastic, the Nexus 4 employs a rubbery compound that makes the phone far easier to grip. Whereas we constantly feared dropping the Optimus G onto either of its glass faces, for a number of reasons we never had that same fear with the Nexus 4. 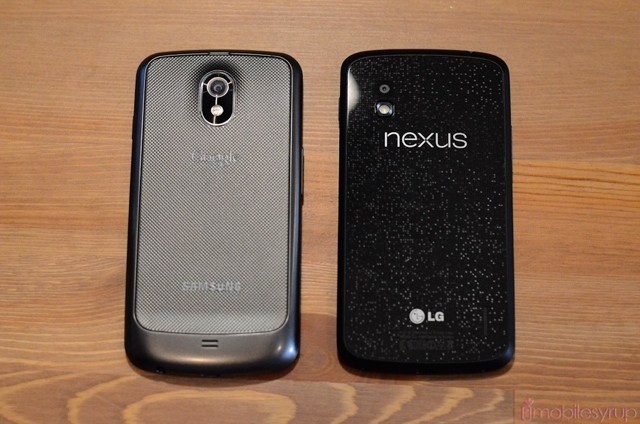 The Nexus 4 is slightly taller and thicker than the Optimus G, but because it is some 3mm narrower, feels far easier to use in one hand. The same goes when compared to the Galaxy Nexus: though they share almost the same dimensions, I found the Nexus 4 more compact and enjoyable to use one-handed despite its larger screen. The two Nexii share an identically-placed notification LED, set in the middle below the screen, which pulses in various colours when vying for your attention. 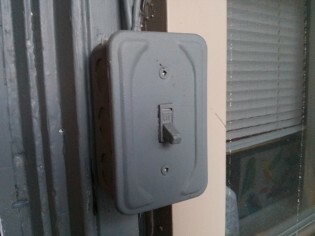 This is our favourite form of a notification light, as it remains invisible until activated. Considering neither the iPhone 5 nor the Lumia 920 employ such a system, we’re confident in saying the Nexus 4 (and Android in general) maintains the best compromise between aesthetic uniformity and obsessive phone-checking tendencies. The microUSB port is centred on the bottom of the phone, and does triple duty as a charging, data transfer and Slimport. But wired isn’t the only way to charge the Nexus 4: employing wireless charging, one can purchase an optional Qi-compatible stand (pronounced “Chi”), or the still-unreleased Nexus 4 Charging Orb, to top up the phone’s battery. Then there’s Miracast, another new standard that promises to provide AirPlay-like screen mirroring for compatible televisions. Near the top on the right side lives the power button. Gone are the days of top-located power buttons, and we’re pretty happy with the trend, though its placement is more a boon for right-handers than lefties. The power button and left-side volume rocker alike could be made with nicer materials; we found them to be, for lack of a better word, “squishy,” as neither seemed to be firmly planted in the phone’s shell. These buttons, and the slightly garish plastic chrome trim around the phone’s front bezel, are the only indications that this device is the result of inevitable cost-cutting on the part of LG. The screen, identical to that of the Optimus G, is stunning. One of the best displays on the market, it’s got 48 more vertical pixels than the Galaxy Nexus, and introduces yet another standard resolution, 1280×768, for developers to concern themselves with. 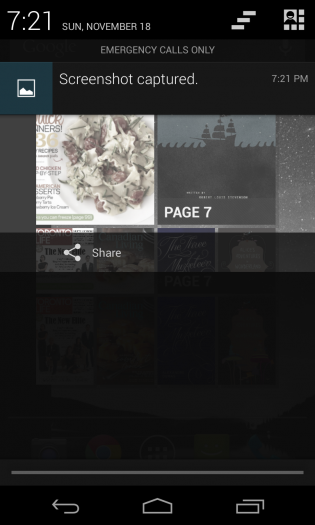 While few apps exhibited any signs of awkwardness, the Nexus 4 lacks the ability to force an app to render in full screen. 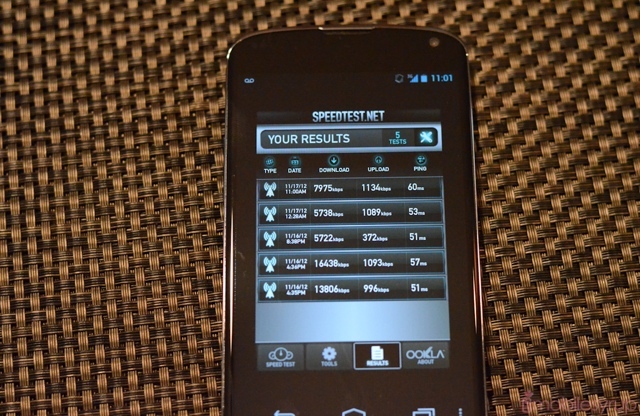 Some apps, like the popular Speedtest, appear letterboxed because they are limited to 4:3 or 16:9 ratios; the Nexus 4 is 5:3. 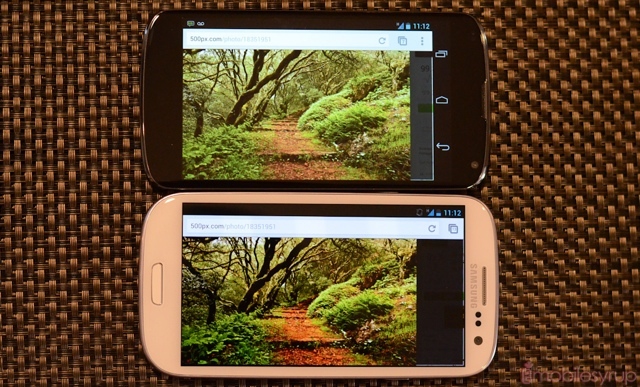 But it must be made clear that the Nexus 4 gives up some 36 of its extra vertical pixels for the on-screen navigation buttons, leaving it with only slightly more real estate than the Samsung Galaxy S III or HTC One X. And how does its screen fidelity compare to those top-tier devices? As we said in the Optimus G review, the Nexus 4 has an extremely clear, luscious IPS display, with a very small gap between the glass and the LCD itself. Reflections, therefore, are lower than traditional LCDs and viewing angles are fantastic. 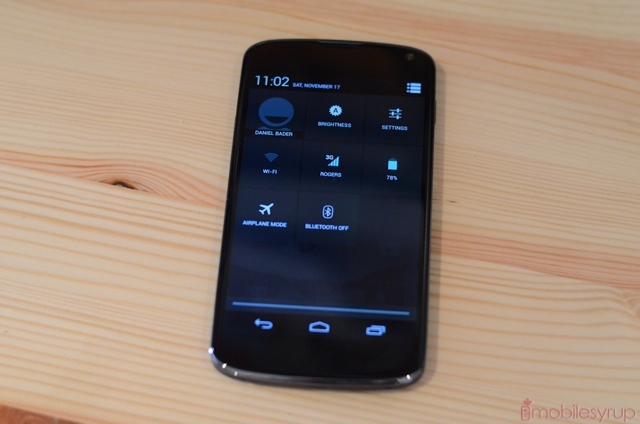 When compared to the Galaxy S III, the Nexus 4 appears muted, even cold, but it should be noted that AMOLED displays are (in)famous for over-saturating colours and obscuring their true nature. When compared to the iPhone 5, both phones manage to eke out every bit of detail from the above fall scene, but the iPhone 5 ultimately renders the image more vividly without obscuring the colours’ true hue. This is because, while the Nexus 4 has one of the highest contrast ratios we’ve seen from a mobile screen, along with excellent maximum brightness, Google has failed to calibrate the screen properly, resulting in colour inaccuracy. It’s not going to prevent you from enjoying what’s rendered, but it prevents the Nexus 4 from toppling the One X or the iPhone 5 as the best display on the market. More miraculous than the excellent screen, for its price the Nexus 4 has some of the top-performing innards of any phone on the market. Sporting a 1.5Ghz quad-core Qualcomm Snapdragon S4 Pro chip, a next-generation Adreno 320 graphics processor and 2GB of DDR2 RAM, there is close to nothing the Nexus 4 can’t accomplish smoothly. Add to that the presence of Google’s latest Android 4.2 software — with no bloatware or hidden software taking up precious clock cycles — and you have yourself one of the fiercest phones currently available. While Android 4.2 is mostly an iterative bump over its predecessor — and is rightfully still referred to as Jelly Bean — there are a number of key improvements that add to the whole experience. 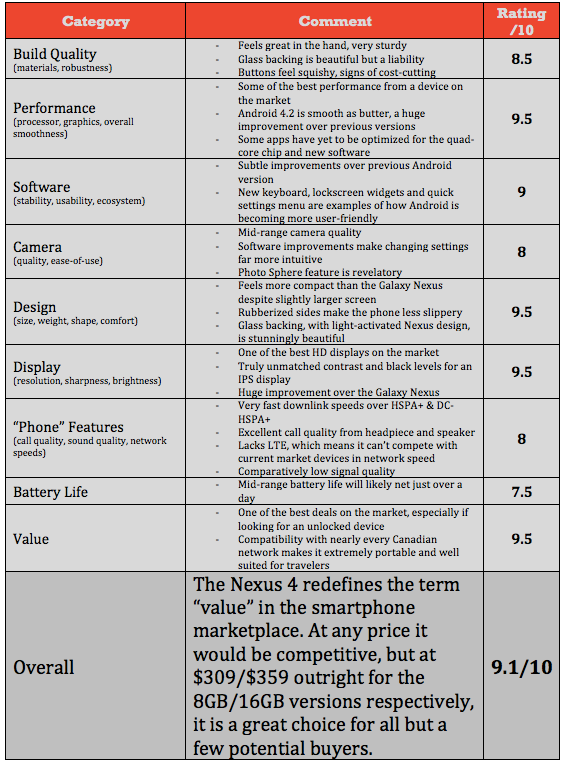 First, however, let us explain why we’re not going to be focusing on benchmark results on the Nexus 4. If you’ve read the reviews of the phone on other sites, you may have noticed that while Google’s new flagship fares well across the board, it doesn’t manage to outscore some aging dual-core Snapdragon S4 devices. This is due to two things, both of which are beyond users’ control but must be looked at individually to understand the larger picture. Second, in order to optimize battery life, Google has engaged a process called thermal-based throttling, whereby the processing cores slow to a speed optimized for temperature and user experience. In other words, when the Nexus 4 gets hot it slows down, both to save battery cycles and to prevent burning its users. Some buyers have complained that the Optimus G gets too hot to hold when playing games or downloading large files; the Nexus 4, for better or worse, does not suffer from this problem. But it also comes at the expense of GPU-based benchmark scores. The Nexus 4, despite these limitations, is an extremely fast device, capable of doing just about anything on Android faster than your current phone. Subjectively, we noticed few slowdowns, though there were occasional force-closes and other signs of immature code. When games performed poorly, it was more due to being unoptimized for Android 4.2 than overworking the GPU. Android 4.2 is not a huge change over its predecessor, but it improves upon what made Android 4.1 Jelly Bean such a fantastic OS. Thanks to Project Butter, the Nexus 4 is incredibly smooth and, with a few exceptions, we would say that this OS is now on par with iOS and Windows Phone 8 in terms of speed and reliability. Perhaps not smoothness but that, too, will come in time. We’ll focus on three improvements: the keyboard, lockscreen widgets and the quick settings menu. Things like Google Now have been back-ported to older versions of Jelly Bean with an update to the Google Search app, so its not entirely new here. The keyboard included with Android 4.2 now rivals iOS and Windows Phone 8: it’s just that good. Not only does it make intelligent predictions of the next word you’re going to type, but it does so in such a way that it never impedes your ability to type in the first place. While iOS contains an occasionally-psychic ability to correct the word you’re currently typing, Android 4.2 will use sentences you’ve previously typed to determine which word you want to use next. That, and a hugely improved autocorrect algorithm, means that Nexus 4 owners will be less inclined to trawl the Play Store for alternatives such as SwiftKey and Swype. 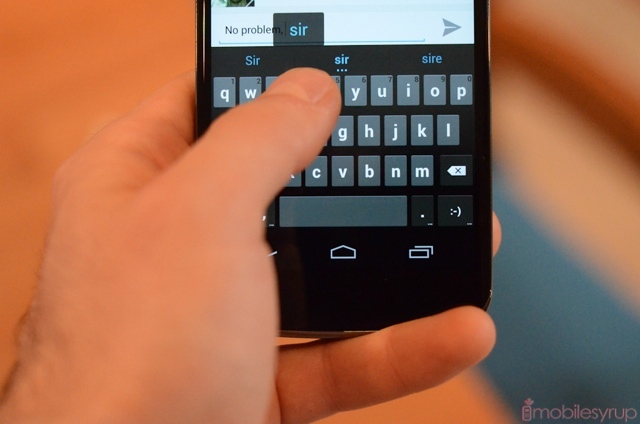 Speaking of Swype, the Android 4.2 keyboard brings gliding to the table, and does it with aplomb. Compared to the half-baked iterations available to owners of modern HTC and Samsung devices, the stock Android 4.2 keyboard never mistakes tapping for swiping, and more than often will assume the correct word on the first go-around. The more you use the keyboard, too, the more it learns about your typing skills. The operating system also better deals with words added to the dictionary. When the phone doesn’t know a word you’ve added, a red line will still appear under it, giving you a list of suggested alternatives. But now, when you want to add that word to the database, it will keep you inside the app instead of spitting you out to the Settings. It’s a small but notable change, and an example of how Google is slowly but surely improving the minutiae of Android’s remaining quirks. 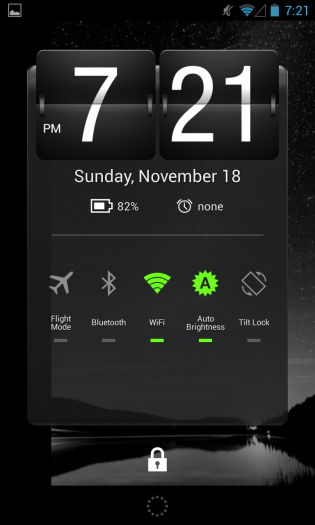 Lockscreen widgets are a great idea — quick access to important information without unlocking your phone — but its implementation feels incomplete. 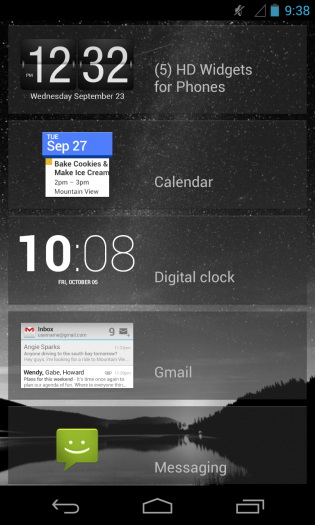 By default, Android 4.2 offers Calendar, Gmail, Clock, Messages and Digital Clock, but developers can integrate their apps into the platform, bringing Twitter, Facebook or weather, among others. Where it goes wrong is in its execution: while you still see the regular lock screen when you turn on your phone, swiping to the right shows off the various widgets. They’re the same as those you’d find on the home screen, scrollable and interactive, but when you attempt to unlock the device most of the widget disappears, leaving only a portion of the original floating like some severed head. It looks ugly, and doesn’t appear to have the same polish as the rest of the OS. 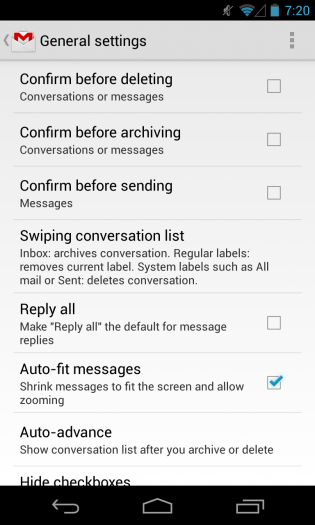 The Quick Settings menu is another addition to Android 4.2, and it builds on ideas introduced by Android OEMs. Samsung and LG incorporate toggles into their notification bars, eating valuable space, pushing actual notifications further down the screen. It’s a clumsy and often-invasive implementation. Motorola, on the other hand, did away with toggles inside the notification shade in its recent version of Android and instead allows users to access the same shortcuts by swiping right on the home screen. Google’s new quick settings menu is by far the most innovative of the bunch. Accessed with a single tap of an icon at the top right of the notification shade, it can also be opened by swiping down from the top of the screen with two fingers. It’s swift and natural and just feels right. A couple more subtle improvements to Android 4.2 underscore just how frustrating it is for the millions of Android users stuck on older versions. At this point it would be impossible for us to endure a device running Gingerbread, and it’s getting to the point where even Ice Cream Sandwich is without some of Android’s most acclaimed features. Not only are expandable notifications and Google Now, two of the best features, Jelly Bean-only, but they’re shaping the way users actually use the OS. Just as lockscreen widgets will inevitably free up room on the home screen, expandable notifications make it easier to determine whether to action a specific email or tweet right away. As we explained in a previous post, Gmail has been updated to support zooming and quick archive, two more minor additions that make a big difference in how you use the app. So too has the app picker been fixed: while it looks the same as on 4.1, double-tapping on a particular icon will bypass the Always/Just once selection and go straight into that app. 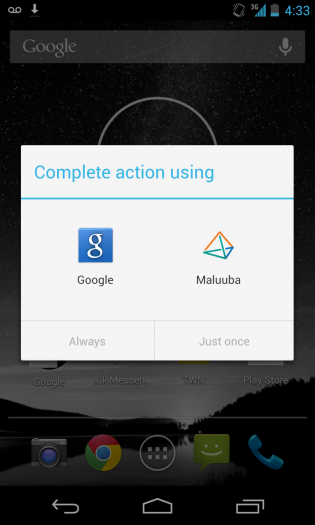 Android 4.2 is the next step in the process of smoothing the rough edges of a once-homely operating system. There is no question that the experience is completely different than just 18 months ago. While many OEMs mask the inherent beauty of Matias Duarte‘s design, it’s clear that Jelly Bean is a stunning and usable operating system in every way. With a robust app ecosystem, flexible home- and lock-screen implementations, the more expansive notifications in the business, a great keyboard and fantastic first-party apps, Android is no longer a me-too OS. It’s setting the standard. We didn’t touch on the new clock app, the screensaver-like Daydream feature and improvements to Project Butter. We’ll take a look at those in the Nexus 10 tablet review. 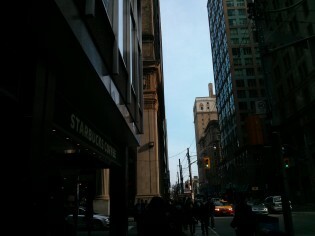 No Nexus device to date has been equipped with a competitive camera. Indeed, this is the first one with sensor that exceeds five megapixels. 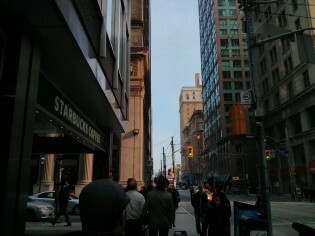 And while the Nexus 4 and the Optimus G share the same sensor, it is the camera experience that is truly notable here. 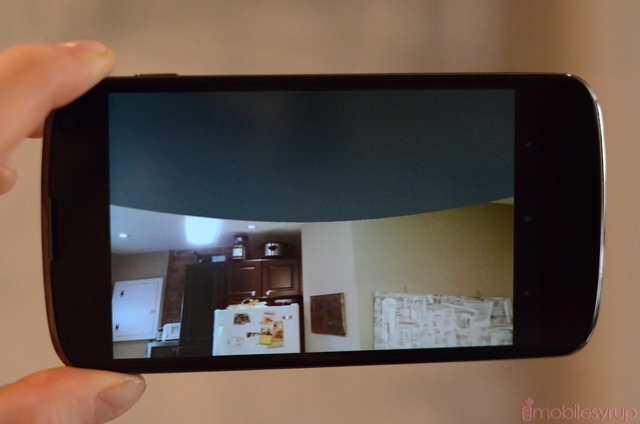 Photo and video quality, as expected, is pretty good. The Nexus 4 can take great photos, there is no doubt, but the sensor does not achieve the same sharp results of the Galaxy S III and iPhone 5. This is due to the fact that the 8MP sensor itself is quite a bit smaller than previous versions, largely eliminating the dreaded “bump” found on many other phones. On the other hand, dynamic range suffers as a result, and because Google quite generously applies artificial sharpening to all photos taken with the Nexus 4, shots have a notable softness to them. Photos taken in good lighting conditions are great, and can be safely compared to other high-end devices in the market, but they’re not remarkable. 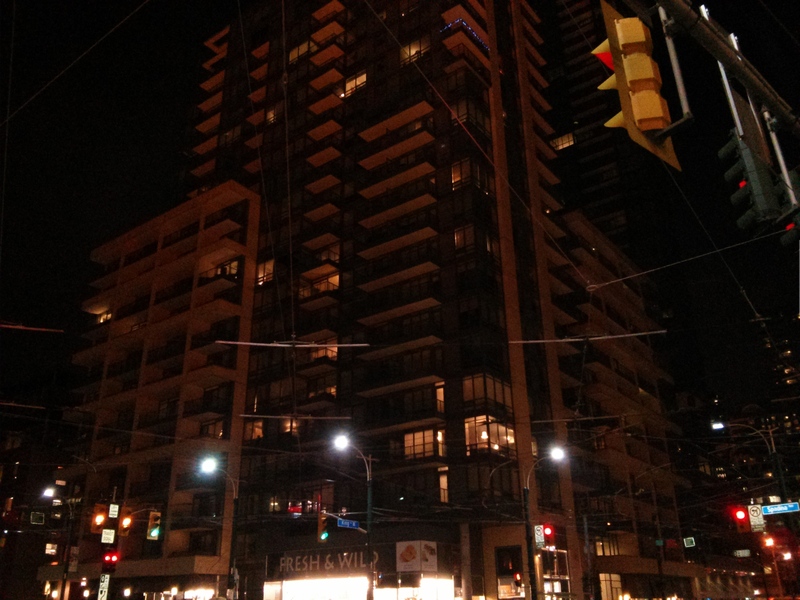 The Nexus 4 also suffers from surplus noise in low-light locales. This is not uncommon in smartphones, as the small sensor size prevents a sufficient amount of light from entering the sensor, but it’s especially notable here. We wish we had better news for avid Android photographers, but the take-away is that the Nexus 4 is a dramatic improvement over the Galaxy Nexus in sharpness, colour reproduction and speed. Unfortunately, it’s not better than the incumbent leaders in the category, namely the Galaxy S III and iPhone 5. 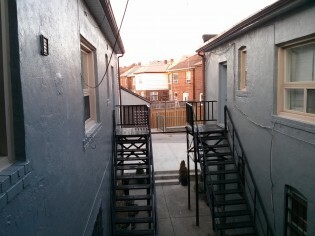 Where the Nexus 4 succeeds is in HDR photos. As you can see from the shots above, the HDR shot (on the right) delivers clear, legible text from a scene where phone sensors traditionally have trouble with dynamic range. Shots are processed quickly, with barely a second added to the overall shot. Video quality, too, is merely good. Like the Optimus G, 1080p video is encoded at around 12Mbps, and is shaky to the point of being unwatchable at times. This doesn’t preclude the Nexus 4 from taking good video, but you must be keenly aware of keeping your hand(s) steady while recording. The good news is that the phone’s microphones are not overly sensitive, and captured audio quality is excellent. 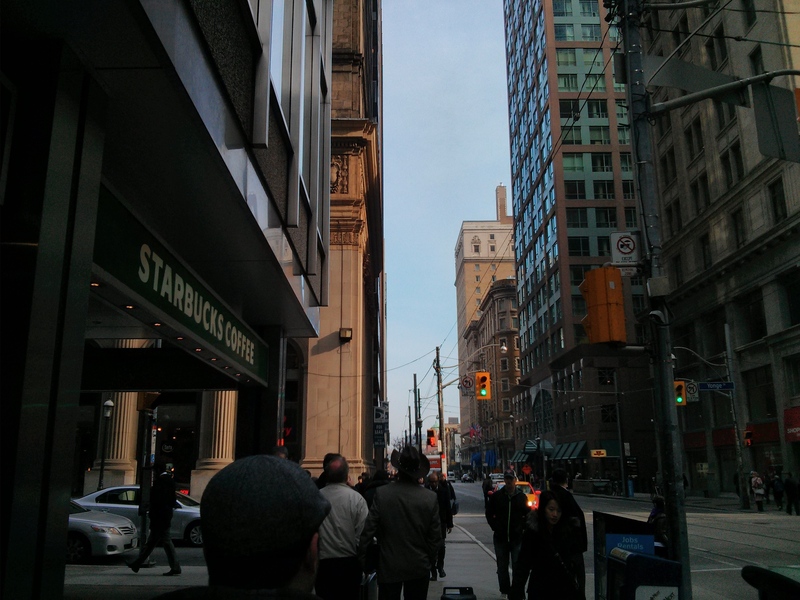 The Nexus 4’s front-facing camera also got an upgrade over its predecessor, and the 1.3MP sensor is sharp and smooth. Nothing more needs to be said about that. 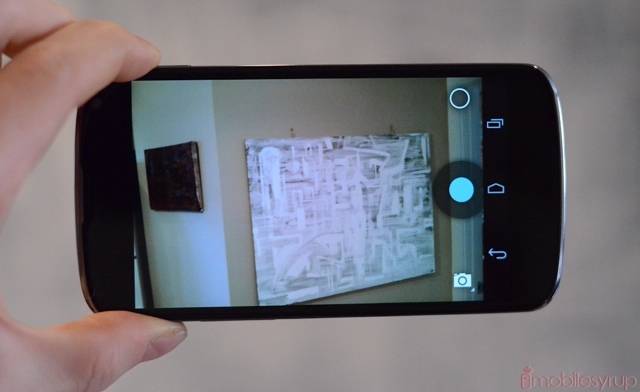 Android 4.2 changes the way users interact with the camera app. 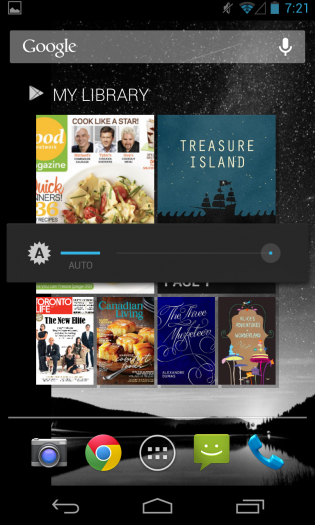 Gone is the permanent right-side menu; instead, users tap on the screen to bring up a circular dialogue. It sounds frustrating in theory, but in practice it allows for quick changes that often mean the difference between a good and bad shot. Digital zoom has also been improved, with clear on-screen values shown as you use your thumb and forefinger to pinch. Unfortunately, the default app doesn’t allow users to change much more than white balance and exposure values; there are no options to alter ISO, or add effects. The HDR mode is useful for situations with large contrast between dark and light scenes, and we found it to work very well under most circumstances. The new Gallery also supports extensive edits to photos and screenshots. 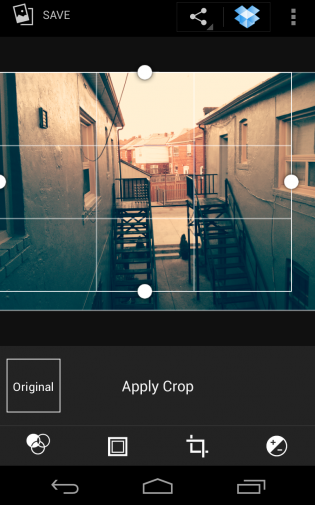 Not only can you add effects, crop photos and change the brightness, sharpness and vibrance of a particular photo, but you can straighten and mirror individual shots, too. 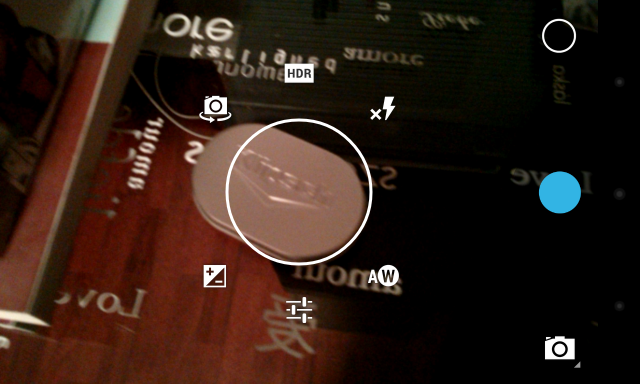 Perhaps the most impressive, and vexing, addition to the Android 4.2 camera is Photo Sphere, an extension of the Panorama mode that debuted in Ice Cream Sandwich. Now, with a careful hand and some nuance, you can capture 360-degree expanses, stitched together with impressive accuracy. The software walks you through how to capture the full panorama: a steady hand, a stable body, and a willingness to follow the blue dot. It may take a few tries to get right, but once completed the results are amazing. You can upload them to Google+ or, even better, to Google Maps, which has a growing directory of public, geo-located panoramas. Despite aggressive CPU throttling and a lack of LTE, we were concerned that the Nexus 4 would not hold up to our regular, ahem, battery of tests. 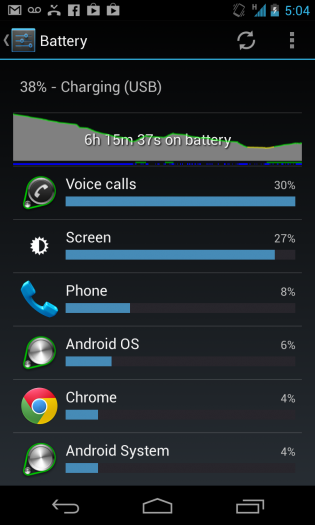 It’s hard to objectively test real-world battery life using a device for only a few days, but we did our best to mimic regular usage on the Nexus 4. This was done by popping our SIM card into the phone, loading our favourite apps and using it as we would a daily driver. This was easy, since the Nexus 4 is factory unlocked and supports any network in Canada. Based on our experience with the LG Optimus G, we knew that battery life would not be best-in-class. This is the second device we’ve tested with Qualcomm’s quad-core Snapdragon S4 Pro chipset, and despite being built on a 28nm process, it is still moderately more energy-intensive than the dual-core version. We did manage to eke out between 10 and 15 hours per charge, but it came nowhere near to the standards set by the Motorola RAZR HD LTE. Battery life on Nexus phones have always been tangibly below the market at their time of release, and while the Nexus 4 uptime dramatically exceeds that of the Galaxy Nexus, it sits comfortably in the middle of the pack. Considering the phone is limited to HSPA+ this is slightly disappointing, but you must remember that battery life is a combination of hardware and software; Google could, and very well may, release an update to fix the device’s nascent battery issues. When we heard about the Nexus 4, the first thing that pundits said was that the phone will never be competitive without LTE support. We will be very clear: lacking LTE is not a huge liability to most Canadians. Those who already have LTE-based phones will certainly notice a speed drop in the uplink, but Canadian have an abundance of choice in this regard. Unlike our neighbours to the south, Canada has three fully-formed UMTS networks capable of performing at high speeds on both HSPA+ (Rogers, Wind, Mobilicity) and DC-HSPA+ (Bell, Telus). While the theoretical maximum speeds of 21Mbps and 42Mbps respectively are unlikely to be reached, every carrier in Canada now claims faster UMTS speeds than America’s second-largest carrier, AT&T. What does this mean in daily use? On Rogers, we were able to consistently achieve near the maximum speeds for a given sector — between 12Mbps and 19Mbps down — with ping times under 80ms. 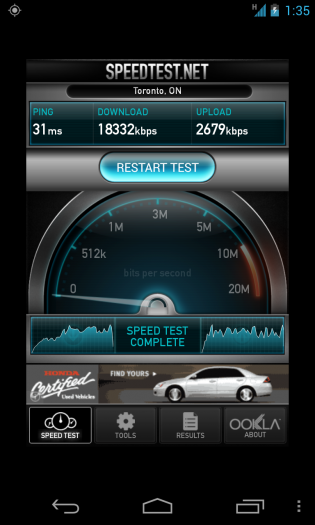 These are download speeds that mimic LTE in certain parts of Canada. The biggest liability for legacy HSPA+ networks is a lack of upload speeds, which max at 5.76Mbps regardless of whether the downlink is aggregated. This shows in our results: download speeds of 16Mbps, combined with a latency of just over 50ms, could be straight out of an LTE sector; it is only the relatively poor 1Mbps upload speeds that give away the phone’s UMTS roots. We weren’t able to measure the speeds of Wind and Mobilicity, mainly because we don’t have a microSIM card for those carriers, but we will do our best to get a hold of them in the near future. 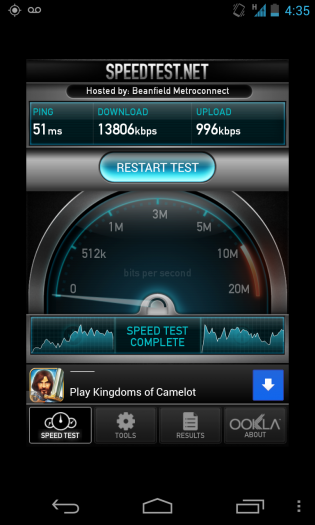 Call quality on the Nexus 4 was good across all networks we tried. Sound through the headpiece and the back speaker was crisp and highly intelligible. Compared to other devices in the same category, the Nexus 4 performed better than most, though it lacked the confident boom of the Motorola RAZR HD LTE, our standard bearer in this category. 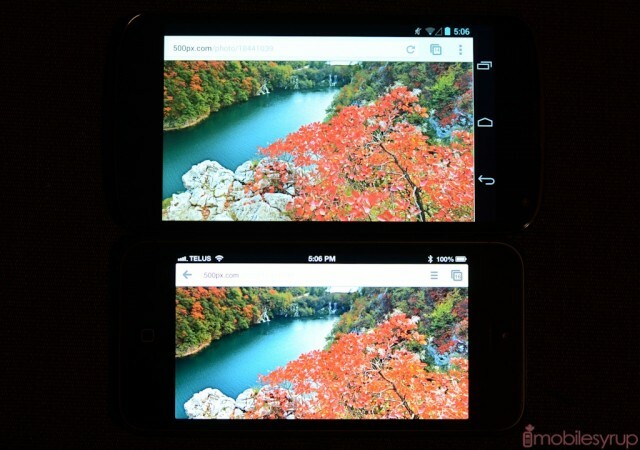 The Nexus 4 did suffer from a small issue related to reception. We found that, like the Optimus G, the Nexus had consistently one to two fewer bars than the equivalent Samsung, Motorola or Apple device on the same network. While we never completely lost service, the relative under-performance of the Nexus 4 antennas concerned us. This only posed a problem in areas of traditionally low signal, such as in buildings with thick walls or in basement apartments, but it was in those places we found the Nexus 4 unable to match the HSPA+ performance of the aforementioned three devices. Update: Note that the RF issues we experienced were not directly related to the number of bars displayed on the device, but to the phone’s actual signal, in decibels, compared to other devices. We tested signal quality, network speed and levels of attenuation in three areas, two of which were prone to low signal quality, and found that the Nexus 4 was a few -dB below in each one. Not a lot, but enough to indicate an issue with antenna design. 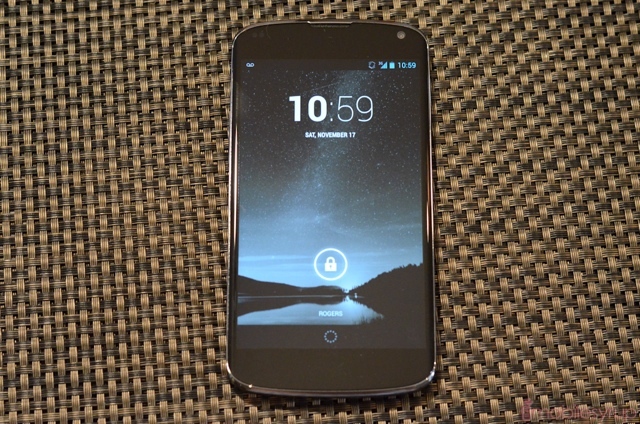 The Nexus 4 is in the enviable position of being the best deal in the smartphone space. It will appeal to different prospective customers for a variety of reasons. The traveller will appreciate its factory unlocked, pentaband radio; the hacker will love its unlockable bootloader and extensive developer support; the deal hound will enjoy its low price; and the enthusiast will clamour for the latest Android software, high-end specs and gorgeous screen. Ultimately, though, its appeal will be limited. The vast majority of Canadian smartphone users will continue to buy their phones at retail store, sign a contract and live for two to three years with the same piece of hardware. For those users, the Optimus G may be a better bet. The Nexus 4’s lack of LTE, no removable battery or expandable storage, mediocre camera quality and vulnerable glass back may turn away a few customers, too. To everyone else, the Nexus 4 is easily the best all-around Android phone currently available, and it cannot be overstated how lucky we are as Canadians to be able to purchase this device and use it on practically any network in the country.